Dozens of students from across the state visited the Capitol building on Wednesday for the fifth year in a row to rally together and speak with state legislators about tuition equity. 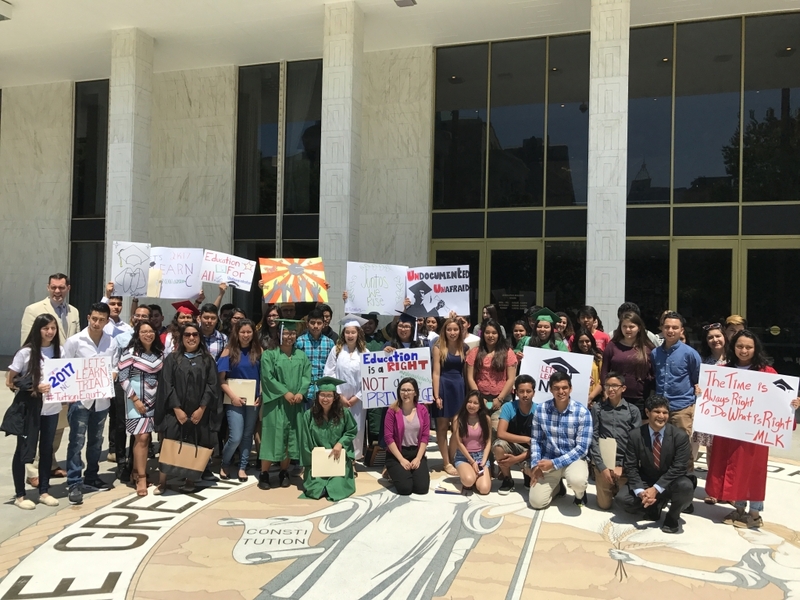 The “Undocugraduation” event was organized by the Adelante Education Coalition, a statewide network of organizations focused on expanding educational opportunities for Latinx/Hispanic and immigrant youth. Some students who attended the event wore their graduation regalia to meetings with legislators, and spoke with them about their hopes and dreams in higher education. Advocates also asked legislators to support HB 734 and SB 652, two bills that would open the door to higher education by allowing undocumented students to qualify for in-state tuition. Approximately 66,000 undocumented immigrant students in North Carolina would benefit from a tuition equity law. Tax Day is just around the corner, and this year is no different than any other for countless undocumented immigrants filling tax forms in North Carolina. Current rhetoric on immigration often overlooks the important contributions undocumented immigrants make to our communities as neighbors, workers, and taxpayers. The Institute on Taxation and Economic Policy recently released a study that highlights the significant contributions that undocumented immigrants make to our state and local economies by paying taxes. According to the report, undocumented immigrants across the United States collectively pay $11.74 billion in state and local taxes. In North Carolina, these community members pay sales and excise taxes on things such as utilities, clothing and gasoline. They also pay property taxes, either directly on their homes or indirectly as renters. Furthermore, undocumented immigrants also pay state income taxes that help grow state investments in schools, transportation, health care, and other services. At least 50 percent of undocumented immigrant households currently file tax returns using Individual Taxpayer Identification Numbers (ITINs), which are the numbers assigned to foreign nationals who do not have a Social Security number. Among those who do not file tax returns, many still have taxes deducted form their paychecks. Policymakers can also analyze tax contributions through the “effective tax rate,” which measures the share of total income paid in taxes. 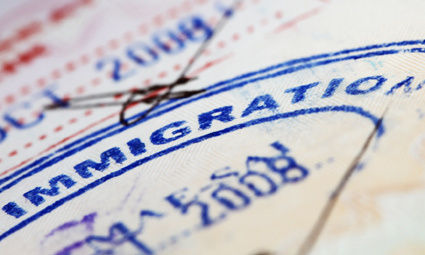 Across the country, the average effective tax rate for undocumented immigrants is 8 percent. This number is especially striking when you compare it to the average nationwide effective tax rate among the richest taxpayers: 5.4 percent. Policymakers can still make wise choices that strengthen our communities and recognize the substantial contributions that immigrants make to our economy and to government revenues. A policy of mass deportation of undocumented immigrants would result in the harmful separation of families, and the loss of neighbors, students and friends. It would also result in a tremendous loss for state and local economies struggling to sustain a post-recession recovery. When it comes to immigration, state and national leaders have an opportunity to explore and enact sound public policies that promote economic growth and immigrant integration, based on facts and reality rather than playing out the politics of fear and division. I am a 7th grade language arts teacher at Waddell Language Academy. I’m also the proud husband of an immigrant. Our school system serves students from all walks of life, and almost 30 percent of our students have a home language other than English. This rich multicultural tapestry offers a daily opportunity for us to learn from each other and experience a variety of perspectives. I welcome every single student who walks through my door with no questions asked because that’s my job and, more importantly, that’s what they need from me. In addition to teaching children how to read and write, I try to instill in them positive character traits such as compassion and empathy. I’ve learned the best way to do that is not by lecturing them about compassion and empathy but by treating them that way myself. In the last month I’ve heard the level of fear on the part of many of my students increase, have seen it in their writing as they react to news of changes in immigration policy and arrests of undocumented immigrants in our community. Across the state my colleagues report rising absenteeism along with impacts on the mental and physical health of our students. Our district is obligated under federal law to educate all children who come to us. I believe that it’s implicit in that mandate that we must consider their overall well-being and do everything we can to support them. Strive to be open and transparent about what’s happening in our community and whether our schools and bus stops are safe from ICE raids. Finally, we need to keep in mind that not sending their children to school can result in our parents entering the criminal system and becoming a priority for deportation. I would ask that, as a district, we ensure that our schools and bus stops are safe harbors and communicate that clearly to parents so they are not keeping their children home out of fear. Along those lines, I would like to thank Superintendent Ann Clark for seeking to verify with local law enforcement and federal immigration officials that our students are safe in our schools. Taking these steps to mitigate the stress and anxiety many of our students are living under right now will help us to carry out our vision of preparing every child to lead a rich and productive life. In so doing, as a district, we can model the compassion and empathy that we want our students to learn. Immigration has been at the forefront of news coverage this week in the wake of President Donald Trump signing executive orders banning refugee resettlement and travel from seven Muslim-majority countries. The orders have been successfully challenged in many courts across the nation, and today, a federal judge in Michigan ordered that officials temporarily halt enforcement of the new immigration restrictions, specifically restrictions against lawful permanent residents. While such orders are encouraging, the future for non-U.S. citizens has never been more uncertain. That was evident Thursday night as a group of people gathered at Raleigh Durham International Airport to welcome home a refugee family of six from the Democratic Republic of Congo. A man with airport security told the group that the family missed a connecting flight in Chicago and would not be showing up. It didn’t take long for the group, balloons and welcome signs in hand, to start questioning the news — was it really a missed connection or was the family detained? Many decided to wait despite the news, some for over an hour. U.S. Committee for Refugees and Immigrants of North Carolina Director Scott Phillips confirmed Friday morning that it was just a missed connection and that the organization’s clients were in the process of rescheduling their flight to the Triangle. As an exception to Trump’s ban on refugee resettlement, the Department of Homeland Security said it would allow 872 refugees to enter the country this week after they were initially barred from flying. The Congolese family is part of that allowance. When asked if they were the last refugee family expected to settle in North Carolina under Trump’s new orders, Phillips said he hoped not. It’s difficult for officials and advocates to give precise and accurate answers in the face of what’s happening because there is still a lot of confusion about Trump’s orders. 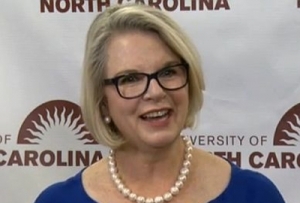 The University of North Carolina at Chapel Hill hosted a forum Wednesday night about immigration law under Trump’s administration. The only certain piece of advice from the two-hour event was that non-U.S. citizens should avoid air travel, especially outside of the country, at all costs until everything gets sorted out. “Nobody knows what to expect in the future,” said C. Lynn Calder, an immigration attorney and professor at UNC School of Law’s Immigration Law Clinic. Law enforcement officials from the Orange County Sheriff’s Office, Chapel Hill Police Department, Carrboro Police Department and the UNC-Chapel Hill Police Department were also on hand and assured the community that immigration was not a priority for their agencies. “I don’t think any of our agencies, nor our communities that we serve expect us to be in the immigration business,” said Chapel Hill Police Chief Chris Blue. Orange County Sheriff Charles Blackwood said he is paying attention to the news but his department’s mission is to serve the will of the community. “I listen to my community, I’m intimately familiar with my community and I try to serve the needs of the community,” he said. Blackwood said it’s hard to know exactly what advice to give to the immigrants living in fear in his community because it’s not a fear he knows personally, but it is one he can empathize with. Jim Huegerich, senior ombuds for the Town of Chapel Hill, said he hopes the forum will spark dialogue throughout the region. There will be an opportunity Saturday in downtown Raleigh to participate in a “no ban, no wall” day of action. A rally is planned from noon to 3 p.m. at Halifax Mall on Jones Street. “MISSION: We stand in solidarity with Muslim, Latinx, refugee, and immigrant communities facing the impacts of recent political acts of discrimination, racism, hatred, and bigotry,” states a Facebook page that’s being used to organize the rally. Phillips said Oak and Dagger Public House is also holding a fundraiser all day to benefit the local U.S. Committee for Refugees and Immigrants. All proceeds from Mil’s Pills drinks will be donated to the organization.